Stay On A Houseboat for the Ultimate Seattle Experience! Forego the typical hotel and stay on a houseboat having two decks with unobstructed views of the Space Needle, downtown Seattle, Gasworks Park and Capitol Hill. Sleeps 4 comfortably in a Master bedroom with a double bed and private bath. Second bedroom has two twin beds and half bath. Salon living room is very spacious, perfect for either entertaining or just being comfortable. Full kitchen and cozy dinette seats 4 people. Breathtaking views with outdoor space, BBQ, and lots of extras. Rooftop deck with outdoor seating and amazing views of Seattle in every direction. 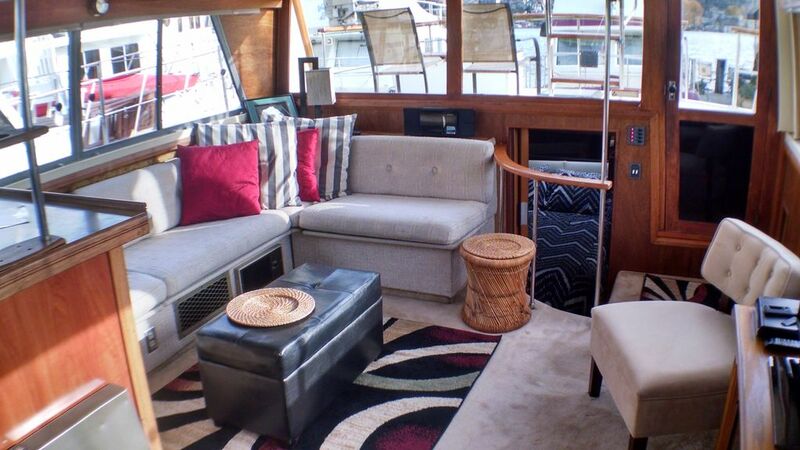 Located in a quiet and friendly houseboat community on the West side of Lake Union. Lots of fun activities nearby including kayaking, electric boat rental, bicycle rental and paddle boarding. Spectacular location for July 4th firework shows. Only 2 miles to downtown Seattle, Pike Place Market, Space Needle, Experience Music Project, Safeco Field (Mariners), and Century Link Field (Seahawks / Sounders). Buses go to all these locations. Many restaurants in local area and walking distance to the popular Fremont neighborhood with its unique craft stores, Sunday market, and restaurants. Guests need to be able to walk up and down a ramp that is about 250 feet to the houseboat as well as maneuver up and down a four step ladder. This property is not appropriate for children under the age of 12. Off-street - parking pass provided. High speed wireless internet throughout boat. Large upper deck with couch, chairs, and table/umbrella and lower deck with chairs. Indoor pool in building in front of marina - cost per use - family swims on Friday and Saturday. 2 miles to downtown Seattle, Pike Place Market, Space Needle, Experience Music Project, Safeco Field (Mariners), and Century Link Field (Seahawks / Sounders). Buses go to all these locations. Many restaurants in local area and in Fremont, one mile north. Finding Bill's boat to stay while in Seattle was a great surprise! Bill was very accommodating and was there to greet us even when our flight was delayed and we didn't arrive until almost midnight! The boat is very comfortable. We enjoyed staying on the lake and so close to so much activity. Even walked all the way around Lake Union! 6 miles! The marina residents were friendly! The only issue we encountered was with the power - couldn't have too much going at one time. This could be updated considering the boat is connected to shore power - but once discovered was workable. Thank you Bill for everything! Hope to connect again when in Seattle area! We spent 2 nights on the Inn Agua in October. The houseboat is very comfortable and well located for the Fremont district and a quick bus or uber downtown. We didn't cook or eat on the boat, but if the weather had been better, we would have loved to. Bed was very comfy. Two things to keep in mind - you need to climb up and down a short ladder to board, so the very young or very old might night be as happy as we were. And the shower is a bit challenging for the very tall. But all part of the adventure. The views over the water to Gasworks and to the skyline were magical at night! Super Cute and Cozy Place To Stay! Thank you for the great and detailed review! It is always nice to have new Seattle visitors to the city and on the boat. You were great guests! Please come back again. Bill was very attentive and hospitable. It's a perfect Seattle location. The boat is well appointed and stocked. Nicely private and quiet marina. We hope to do this again someday. The host Bill was so accommodating and friendly he even carried my “heavy bags” !! We were a party of 4 and had plenty of room to enjoy ourselves particularly sitting up in the deck enjoying afternoon beverages and watching the sun set over Seattle. Will definitely recommend staying here for a fun, relaxing alternative to hotels. We enjoyed our stay very much! Thank you Bill for a memorable place to stay on our anniversary. Kayak and Paddleboard rentals next door to marina.